L.L.L4L.L.L. : Is this what you see as important in your school library? Is this what you see as important in your school library? Image by vanhookc via Flickr Doug Johnson in his blog What do our school buildings say about us? stated that "designers of most educational spaces seem to concentrate on low cost construction, ease of maintenance, security, and visual control. Comfort, aesthetics, and inspiration don't much figure into the design process." Unfortunately comfort, aesthetics, and inspiration are factors that stimulate learning. Doug suggests other ways to show respect for facility users include providing indirect lighting; varying elevations in ceiling heights; including real windows and skylights to provide natural light; the use of warmth-creating wood and fabric surfaces; and the provision of comfortable work/study/reading areas that are relatively easy to change the configuration of. Also the inclusion of places to display student work and interesting pieces of art on either a permanent or rotating basic make the learning space visually appealing. 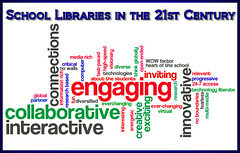 The following presentation includes extracts from:The School Library: A 21 Century Classroom? presented by Dr Carol Gordon at Armidale in 2009. Imagining the Future of the School Library (with Rolf Erikson and Christian Long), DesignShare, November, 2006.